Want to brighten up your breakfasts? Here’s a simple and easy one straight out of the Basecamp Kitchen! You don’t have to eat it in a bowl – if you’re rushing out of the front door simply keep it in a smoothie mug! Packed full of antioxidants, vitamins and protein, this brekkie is the perfect way to kickstart your day! Add all ingredients to a blender and blitz until well combined. Pour into a glass or a small bowl. 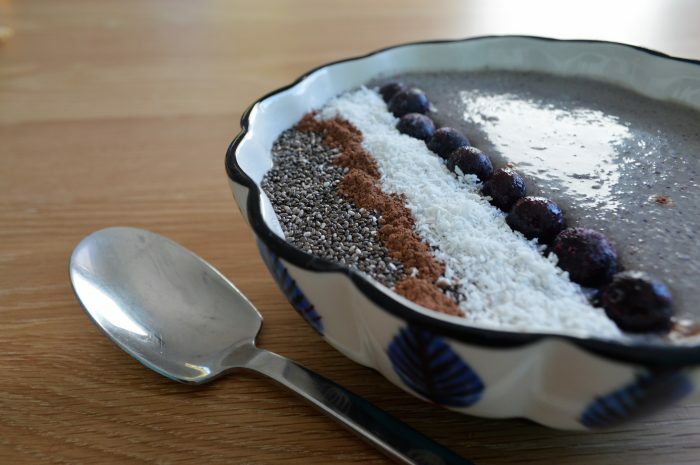 Top with a sprinkle of buckwheat, coconut or seeds for some extra crunch! Enjoy eating this thick smoothie with a spoon for an energising breakfast. Serve with: sprinkle of activated buckwheat, coconut flakes or extra seeds.